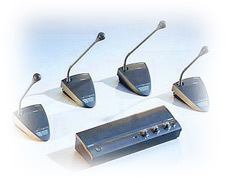 Congress Rental USA's Bosch CCS 800 Ultro Analog Discussion System is an economic, high-quality electronic microphone system. The interface is user-friendly, and the plug-and-play design is simple to install and extremely versatile. The system can be configured to support up to 150 microphones (50 microphones per Control Unit and a maximum of 3 CUs per system). The double headphone socket and flexible microphone stem allow two people to use the same delegate unit. The CCS 800 is best suited for small-to-medium sized meetings and conferences held in facilities like local government councils, hotel conference rooms, training and educational venues and company boardrooms. Proceedings can be fully managed by utilizing certain settings for microphone prioritization and the number of open microphones.